Let me start off with saying the you will need to decide a few things before you begin your used car search in Costa Rica. You will first need to decide if you should ship your vehicle from your homeland down or if you should buy one when you get there. There is no real correct answer, as both options will cost you more that you had originally anticipated. You see Costa Rica has rather extreme impuestas (import duties) on imported vehicles. In some cases nearly 78% of the blue book cost. This means that once you ship your vehicle down you could end up paying its worth just in taxes to get it legal. This also means that vehicles may cost twice as much as they do back in your homeland, depending upon where you are coming from. * Check out the website http://www.hacienda.go.cr/autohacienda/Autovalor.aspx to find out the import taxes on your particular year make and model vehicle. So it goes without saying that the second thing that you will need when buying a used car in Costa Rica is more money budgeted toward a vehicle that you had originally anticipated. 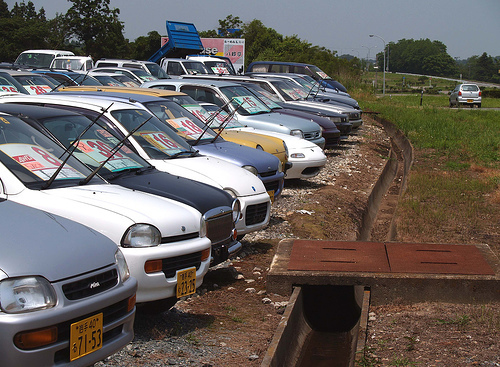 We wanted to spend around 3-4 thousand US dollars on a used vehicle around 10-20 years old. This didn’t leave us much room in the current market. It wasn’t impossible to find something that would work, we just had to spend a little more time looking. Let me try to explain what we were up against in our decision making and limited budget. We sold a 2000 Ford Econo-line back in San Diego, to a friend. The vehicle was in great shape and was a great vehicle for when we were doing large purchases of vintage clothing for the business. After we mainstreamed the vintage wholesale operation the van turned into a great camper/surf wagon. I could keep a few boards locked and loaded at all times for local surf expeditions. It wasn’t very practical for a family vehicle, so when the opportunity arose, we new that we needed to get rid of it. We sold the van for 3 thousand dollars and planned on using the funds from the sale to purchase a vehicle in Costa Rica. Upon arrival we noticed that there was nothing worth while or in any type of running condition for a mom a toddler and an infant that was in our price range so we immediately bumped up our budget by another thousand dollars. Doing this we then took into consideration shipping down our other car a 2001 Ford Escape that we left with our family in Texas. It would cost under one thousand five hundred to ship it down if we were diligent looking for an economical broker. It should cost us just under three thousand dollars more on import fees, then we have a vehicle. So we opted for buying a vehicle so that we had transportation sooner than later, however; we still may ship our escape down at a later date. One of the first things that we needed to figure out was how to find a vehicle. We learned quickly that even though Craigs List Costa Rica (http://costarica.en.craigslist.org/) list is pretty thorough with a number of vehicles, all of the ones that we could find on their site were top dollar. Craig’s List Costa Rica hardly had anything in our price range, and when they did and we took a look at it the vehicle, every time the vehicle was pretty beat up. We had much better luck finding a vehicle in our price range on Costa Rica Autos (http://CRAUTOS.COM) and Mercodo Libre (http://home.mercadolibre.co.cr). As I mentioned earlier, the import taxes are pretty bruttle on vehicles, so it is important to make sure that all the taxes and the Revisión Técnica (aka Riteve) are up to date on the vehicle your are interested in purchasing. The Riteve is the inspection. Most vehicles in Costa Rica need an inspection once a year, some newer vehicles need them every two years. The month that your vehicle is due for an inspection correlates with the last number on your license plate. For example if your last number is a 6, you need to have your vehicle inspected in the month of June, and so on. Seat Belts : You have one for each seat the belts are working properly and have no cuts or wear. Steering Wheel : It works correctly. Does not have excessive play. Wipers : are in good condition, operate and clean the windshield. Polarized visors (if any): Check that the brushes do not touch. Mirror : It’s in good condition and secure. Doors : Open and close properly. Fuel cap : Capped and secure. Front and rear bumper : They’re in good condition and securely attached. Reflective : They are 2 red and reflect light at night. This is for certain high capacity passenger vehicles like tourist type vans. Light over License Plate : Lights up and is not loose. Brake lights : 2 lateral and 1 central, are red, they work and are in good condition. Rear turn signals : Red, orange, no more than 4, are working and in good condition. Directional : They’re white or orange, no more than 4, and are working and in good condition. High and low beams : No more than 4, white or yellow color with no difference between them.Subject and in good condition. The change of high and low light work. Halogen (if any): They are white or yellow and should not work with high beams. Decorative lighting products you may have installed and which are prohibited by law. Mufflers, smoke and any noise : If gasoline engine accelerates and smokes, will not pass RTV. No abnormal noises or have the air filter or carburetor modified. Muffler required. Tires : They are smooth, no cuts, bulges and with sufficient tread. Fenders : Secured and in good condition. Plates : The numbers are easily read match the title. Title: You MUST have the original title and not a copy. Fluid levels Must be full. Oil, water, brakes, etc. If the owner before you has not paid the Riteve in past years or has unpaid parking or speeding tickets the vehicle will most likely have fines attached to it. You can check and see if there are any fines on the vehicle you are looking to purchase at the Cosevi Website. http://www.csv.go.cr/. When you decide to purchase a vehicle you will need a lawyer to do the paper work and transfer the title. Don’t worry this is rather common for any type of negotiations that you will do in Costa Rica. Our lawyer cost a total of a $135, and was set up by the old vehicle owner. He was also available at 7:30 pm. The lawyer will do a vehicle history check when he is transferring the title, but if you want to save a little time and disappointment I would go ahead and do a check yourself before you get caught with anything off guard in the attorneys office. I would also recommend getting a mechanic to check out the vehicle that your interested in purchasing. Many of the vehicles that have been driving on these roads for the past twenty years are pretty beat-up and the history on them is sometimes a little shady. Unless you are pretty confident in your mechanical skills, I would have a mechanic either come with you or schedule to have one check out your vehicle before you purchase it. After looking a few different vehicles in a three week period, I was exhausted and thought that it would be impossible to find something decent in our price range. A friend of mine found a Jeep grand Cherokee for sale that was a little out of our price range, but the price was negotiable so I thought that I would check it out. My buddy offered to come with me and bring his brother in-law who is a mechanic just in-case I was interested in the vehicle. After test driving the vehicle I was sold. This was the best thing that I had test driven yet, and it even gave me hope that I would find something nice in our budget. I was ready to sign on the dotted line until the mechanic gave me the N0-go sign. I was so impressed that all of the gauges worked and the vehicle seamed to start and stop fine that I totally overlooked the fact that the 4 wheel drive was not working, the car lacked power, the transmission had a knock and the vehicle pulled hard to the right when you stepped on the breaks. Having a mechanic along for the ride saved me from getting a bad deal. He also came in very handy when I did find the right car for our budget.